By Sören Lund for UGG. It was with great anticipation that I went to my mailbox. I had bought a stompbox and it was suppose to arrive this morning. Oh yeah, there it was. With a feeling, not unlike that of a child before christmas, I quickly walked back to my house, passing the lawn in serious need of a trimming and my car, so dirty that only the rooftop was revealing it’s colour. The scedualed work for this day. But with an unproven stomp in the hand, who cares about trivialities like that. So, followed by a couple of nasty remarks from my better half, I dissapeared into my musicroom and fired up the amplifier. After unwrapping it I took some time to enjoy the visual appearence of the Cobalt. Really beautiful with it’s Black/darkblue coating. Four Buttons, an LED and a footswitch. All text on it seems to be handwritten. Very nice. Really boosts the felling of Boutique and limited production. That, combined with the relative high price on the pedal made my expectations go pretty high as I plugged it into my amplifier. The previous owner that had mailed it to me, had placed a little note in the wrapping recommending me to read the manual carefully, which however I chose to ignore at first. Bad mistake. Started up by setting all knobs at twelve o’clock and punched it in. At first I was thrilled what it did to the sound. It really opened up the amp and I just “blazed away doing all my stuff”. But after a while I started to attempt other settings and then my time of trouble started. The knobs did not respond as I expected at all. Very confusing. Turning one made the others change too it seemed. So I turned my attention to the manual and after a couple of hours of reading the same little piece of paper again and again and turning knobs back and forward and back again, I started to get it. The Gain-knob is an input adjustment to set according to your guitar output. Be very careful with this one. Too much of this and you loose the great dynamics of the Cobalt. Too little and you won’t get the overdrive. The drive-knob sets the amount of overdrive. The bias-knob is a kind of compression. Using it past twelve makes it More fuzzy-like. Personally I didn’t like that as the dynamic response is very important to my playingstyle and it seems to loose some of that up there. But I’m sure other players might find it useful. Finally the volume-knob sets the output signal. Not really too difficult once you get the hang of it, but it takes a while to understand that the knobs actually works together, not against eachother. The Blackbox Cobalt is a professional tool for the serious musician. Not an easy to approach Boss-distortion. But take the time to get to know it and you will have, in my opinion anyway, one of the very best, most versitile and dynamic Boost/overdrive stompboxes out there. It will do almost anything except heavy distortion. But who expects that from a pedal called “cleanboost”. I have used it for punching in at solos. As an extra channel with a little dirt or simply to boost the signal from a low-output Guitar. It does everything with flying colours. As a test I tried to set it so it did absolutely nothing to the sound and it was impossible to hear wheather it was in or out. Transparent to the extreme. Great. 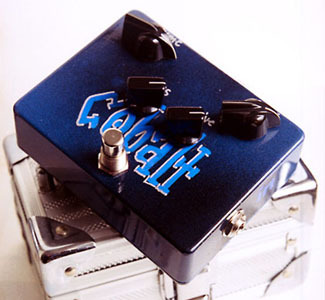 After getting to know the Cobalt properly I absolutely love this stomp and I have only one serious problem left. It’s versitility will eventually course serious injury to my financial status. I want to use it in at least two different ways, but that’s not very practical in a live situation. So I simply just got’s to have one more.